Wallabies great John Eales believes Ewen McKenzie's inaugural squad members are the players who will set the tone for the new coach's reign. McKenzie will coach the Wallabies for the first time in the opening Bledisloe Cup match against New Zealand on August 17. 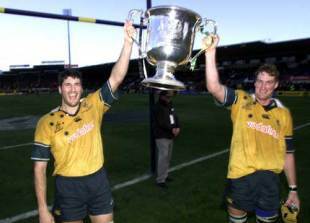 Former skipper Eales combined with coach Rod Macqueen in one of Australian rugby's greatest eras from 1997 to 2001, during which they won the 1999 World Cup, Australia's first Tri-Nations title and defeated the 2001 British and Irish Lions. Eales was reluctant to speculate on whether McKenzie could build a similar period of success, saying it's up to the players to define what they want to achieve under the new coach. "It's really hard to compare and say `will it be like this, will it be like that? '," Eales said from a Queensland Small Business breakfast on the Gold Coast on Wednesday. "They've just got to look and say `this is our own time, this is our own era', and then create their own history. It's not about what's happened before the 17th of August this year when they play the Bledisloe, it's about what happens after that." Eales believes if the Brumbies beat the Chiefs in this weekend's Super Rugby final, it could have a flow-on effect for the Wallabies. Australia's last major international rugby success was the 2011 tri-nations title, won just weeks after the Queensland Reds had secured the Super Rugby championship. "Hopefully, after this weekend we'll have the Brumbies and the Reds who have tasted Super Rugby success and that's up against the best of the southern hemisphere," Eales said. "That has to build confidence when you can do that." Eales says there's no doubt Australia can beat the formidable All Blacks, but only if they can out-battle the world champions. "The All Blacks are the best team in the world. They've been very consistent over a long period of time," Eales said. "It'll be hard but they'll be in there fighting."